The G20 Summit in Argentina offered a glimpse of what international meetings of world leaders are supposed to be. The world public was treated to images of smiling statesmen and women in relaxed surroundings, communiques endorsing multilateral cooperation for peace and prosperity, and many eagerly awaited side meetings on individual issues. Heads of the world’s two largest economies—the United States and China—agreed to take a 90-day break in their escalating trade dispute, the British prime minister had a chance to make her case directly to other leaders about Brexit, and the Russian president and the leader of Saudi Arabia played the spoiler role by high-fiving in their adjacent seats. Relations among countries in Asia are for the moment in relatively quiet and constructive phases. 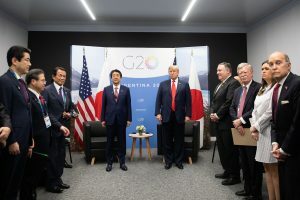 In addition to the U.S.-Chinese commitment to negotiations, Japan and Russia are discussing the long-standing issues of a formal end to World War II and the status of the disputed Northern Territories. North Korea is grumbling about a lack of U.S. gestures of good will, but refrains from provocations, and there is talk of a second summit meeting between President Donald Trump and Chairman Kim Jong Un. The new normal in the South China Sea includes close encounters between American and Chinese warships, but neither side seems inclined to escalate. Indeed, the most important bilateral relations that are deteriorating are between Japan and the Republic of Korea, which amount more to loss of opportunities than threats to peace. Only the cloud of trade negotiations hangs on the otherwise bright horizon of U.S.-Japan relations. Can these positive trends continue, or is East Asia in a “phony peace” that will soon be replaced by economic and even military tensions and crises? What can the countries in the region do to turn this period into a longer period of positive relations? The course of the U.S.-China relationship will have the most widespread effect on the region. However current issues are resolved, the economic, political, and security competition between a rising China and established United States will continue. However, the form that competition takes is important for the region. Until about 2012 the competition was primarily economic and commercial. Political and military relations had elements both of cooperation and of competition. At that point, a confident and impatient China decided to assert itself in the region in a more aggressive manner, especially in the South China Sea, to proclaim rather than minimize its mercantilist economic and business policies, and to tighten its internal controls. The United States responded with more assertive security and economic policies of its own. For the United States, slowing trade with China has also exacted an economic as well as a domestic political cost. Both countries have now had a chance to experience the effects of this sharper phase of the relationship. China’s economic growth has been slowed by downturns in international investment and trade, and it has antagonized all its neighbors to the south and east. For the United States, slowing trade with China has also exacted an economic as well as a domestic political cost. It is likely that both countries will enter the negotiations early next year looking for ways to restore better economic relations. Success will require concessions by China on issues of intellectual property protection, subsidies to state-owned enterprises, and treatment of foreign companies in the domestic market. It will require concessions by the United States of restrictions on Chinese investments and lowering of recently imposed tariffs. Prognostication is difficult, but it appears that China realizes it has overplayed its hand in recent years, that it should follow Deng Xiaoping’s counsel of patience for a while longer, while the United States seems to realize that tariff wars cause casualties on both sides. The chances for compromise on trade issues seem promising. Prospects on the Korean Peninsula seem less so. No summitry can obscure the basic incompatibility of American and North Korean objectives: The United States insists on the “final, fully verified denuclearization” of North Korea, while the DPRK considers its nuclear capability to be essential for survival. With President Trump stating recently that he is in no rush to complete denuclearization, there is perhaps room to cobble together a set of political gestures, limited economic measures and nuclear declarations and inspections that will prolong the current situation. However, it seems inevitable that North Korea will return someday to a new provocation phase of its cyclical policy pattern. We have always been able to count on North Korea to unite its foes through outrageous behavior, and there is little reason to believe that things have changed. Finally, what are the prospects for U.S.-Japan relations? In Buenos Aires, Prime Minster Shinzo Abe again was the wise leading senior statesman we have come to expect at these gatherings in recent years. With Germany’s Chancellor Angela Merkel having announced her retirement, he has become the most experienced, constructive, consistent, and active democratic leader on the world scene. President Trump, with an anthropomorphic approach to international relations, clearly values his friend Shinzo Abe. American and Japanese policies are exactly aligned on the North Korean and Chinese challenges, and it is difficult to believe that the seasoned trade negotiators in both countries cannot come up with an agreement that both leaders can accept. That both countries are looking to stabilize economic relations with China should help them reach agreement between themselves. In summary, the prospects for positive and solid U.S.-Japan relations are good. It is very much in the interests of both the United States and Japan that their Alliance remain solid and their foreign policies aligned. Together, they can handle the challenges of a dynamic and potentially dangerous region; divided, the future is much darker.